The Ebro River Delta, located along the eastern coast of (Spain), is one of the largest wetland areas (320 km2) in the western Mediterranean region. The Ebro delta has grown rapidly - the historical rate of growth of the delta is demonstrated by the city of Amposta. This city was a seaport in the 4th Century, and is now located well inland from the current Ebro river mouth. The rounded form of the delta attests to the balance between sediment deposition by the Ebro River and removal of this material by wave erosion. The modern delta is in intensive agricultural use for rice, fruit, and vegetables. 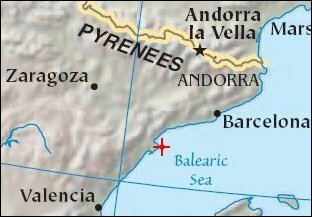 White polygonal areas to the north and south of the Ebro River are paddy fields. 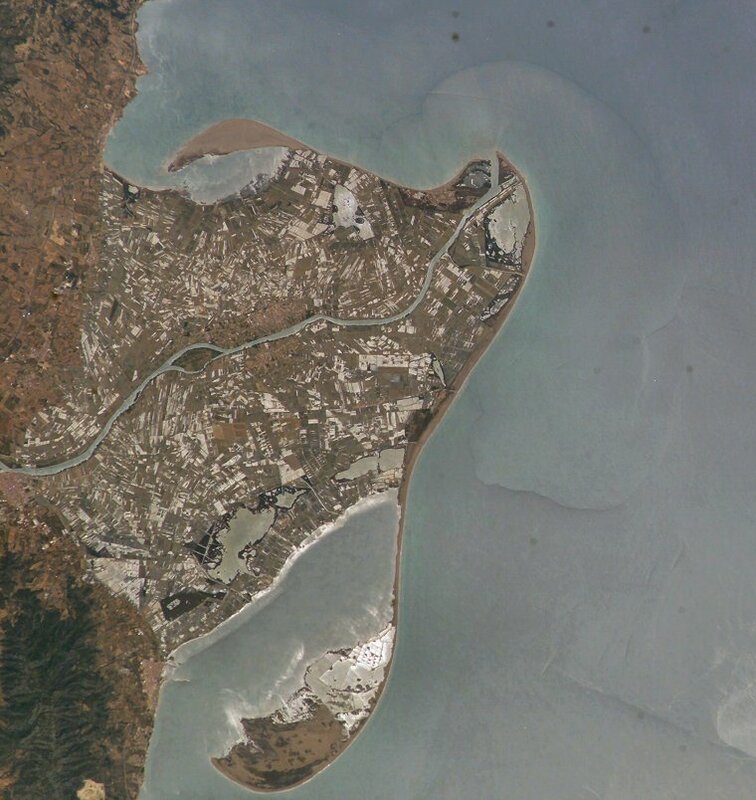 The Ebro delta also hosts numerous beaches, marshes, and salt pans that provide habitat for over 300 species of birds. A large part of the delta was designated as Parc Natural del Delta de l’Ebre (Ebre Delta National Park) in 1983. A network of canals and irrigation ditches constructed by both agricultural and conservation groups are helping to maintain the ecologic and economic resources of the Ebro Delta. This astronaut photograph, taken in partial sunglint, also shows the Ebro’s fresh water lens - the water density boundary between the upper layer of fresh water issuing from the Ebro River mouth and the saltier, denser Mediterranean Sea water. Diversion and impoundment of the Ebro River upstream has led to a decrease in water and sediment delivery to the delta. This decrease has led to increased erosion in some areas to the northeast of El Fangar Bay and along the southwestern shoreline of the delta.